THIS IS A VERY HIGH ALCOHOL TREAT. IF THAT IS NOT YOUR THING, SKIP THE RECIPE. RUMTOPF is a traditional way to preserve fruit in alcohol. While rum is traditional, hence the name, it can also be made with other spirits, like Vodka, Brandy... so long as the alcohol % is high enough, and the fruits remain covered in the luquid. It lasts for years in a cool dark place, and gets better the longer it is allowed to steep. I keep the jars in the back of my fridge. Delicious by themselves, over ice cream, as the alcohol used in Schwarzwälder Kirschtorte and I add some to my Weihnachtsstollen. 50%+ alcohol content is needed to prevent spoiling, I use 55%. HOWEVER, the spirits commonly available in the US, do not have a high enough % to preserve long without spoiling. 40% or around 80 proof is most common. So here is the method to raise the alcohol % in the commonly available spirits,. OUT COMES THE EVERCLEAR, a 95% clear grain alcohol. Each 1/8 c. Everclear added to 1 c 40%, raises the alcohol % by 5%. 1c 40% + 1/4 c Ever, = 50%, = 100 proof... you get the picture. DO NOT USE FLAVORED ALCOHOL FOR THIS, what you add provids the flavor. Traditionally Rumtopf was an ongoing process. In a big crock, the first fruits/berries of the harvest, peaches washed, peeled and cut up, (only the best quality, no blemishes to prevent spoiling) were put into the crock, sugar was added, the fruits were covered with alcohol, the crock was closed and stored cool and dark. Before refrigeration, in the cellar in the back of a shelf, out of sight out of mind, untill the next fruits, strawberries were ripe, they and more sugar and alcohol went in, all through the Fall harvest. Apples and pears were pealed and chopped. Then it was stored to mature until at least Christmas. NO PRIOR SAMPLING WAS ALLOWED OR, SO LORD HELP YOU, THE LADY OF THE HOUSE WOULD NOT BE FORGIVING AND NO RUMTOPF FOR YOU THAT YEAR. Fruit and berries that are not good for this are gooseberries, blueberries and others with hard waxy skins, The alcohol can not penetrate the skins. Raspberries turn very hard in the alcohol but can be used. AND NO CITRUS. Dreid fruit bits can also be used. Some companies sell the chopped up mixed fruit bits in bags. I like those. Rumtopf jar or canning jars with lids. Best quality fruit, berries, cleaned and stoned (the fruit, not you) or dried fruit. - Clean your container and lid. - alcohol and everclear mix to cover all the fruit and sugar. - check occasionally if a bit more alcohol needs to be added to cover the fruit. Stuff them right in, then add the alcohol. It makes for a spiced mix, good for Winter and Stollen. Enjoy in moderation and don’t drive after. You can bring the alcohol % in brandy, rum etc. up by adding Everclear. Rumtopf should have 50+% alcohol for best preservation for a long time. Proof is double the number of %. 40% = 80 proof. Based on the commonly available 40% rum etc. Each 1/8 c. Everclear added to 1 c. 40% spirits, raises the alcohol % by 5%. So 1 c 40% + 1/8 c Everclear = 45% and so on up. Everclear by itself, makes the fruit harder and the liquid too harsh tasting IMHO. But it could be certainly be done. Any comments about using EVERCLEAR in a Rumtopf? 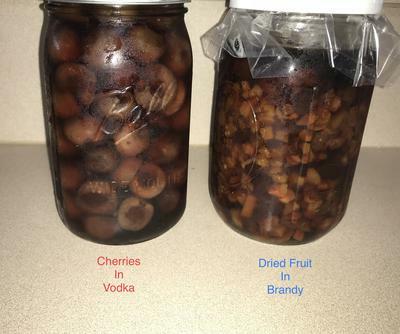 I generally just spoon out the fruit and leave the liquid for another batch, but like to hear others experience at starting with 190 Proof alcohol to preserve the fruit. The other fruit usually turn soft in the mix, apples don’t. At best they get a little leathery. You munch on the soft fruit and all of a sudden you hit a piece with a totally different texture. You could add apple but they have to be peeled and cut small. Experimenting may be in order. If you do, please, post your findings here. There's a debate about adding apples. Some people do and others don't like to. The apples' texture is something that is either liked or not. I'd suggest perhaps adding some apples to a small batch of rumtopf and then you'll see if you like it. That way, you'll know for next year and can either add lots or omit them.